Simon & Schuster, 9781439187012, 272pp. Deborah Feldman was raised in the Satmar Hasidic community in the Williamsburg section of Brooklyn, New York. She attends Sarah Lawrence College and lives in New York City with her son. The heroines in the books Deborah read as a girl were her first inspirations, the first to make her consider her own potential outside of her community. Which literary characters have inspired you? As a girl, with two absentee parents and an outspoken nature, Deborah was systematically made to feel different or “bad.” How did the structure of Satmar Hasidic culture make her feel such shame, and how did this shame serve to subjugate her? When Deobrah learns that King David—a sainted historical figure who supposedly did no wrong—is a murderer and a hypocrite, she writes, “I am not aware at this moment that I have lost my innocence. I will realize it many years later.” What is the line between innocence and willful ignorance? How did Deborah’s ability and willingness to question authority and think for herself change the course of her life? The cloistered Satmar community is located on the outskirts of New York City, one of the most racially, spiritually and culturally diverse places in America. How do aspects of the outside world enter Deborah’s consciousness, and how do you think these glimpses of life outside her insular community impacted her development? 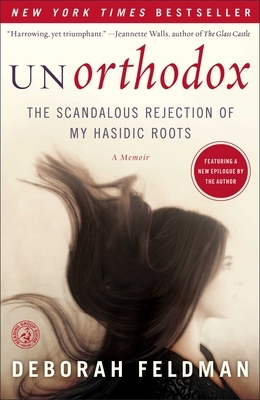 Deborah writes of the various ways she was restricted and constrained by her religion, but her grandparents found solace in the strict Hasidic community after the Holocaust. Were there any positive aspects of her tightly knit sect? How was Deborah’s life affected by gossip and the fear of scrutiny from her friends and neighbors? How have other people’s judgments and criticisms affected your own life? How much were Deborah’s Bubby and her aunts responsible for the unhappiness in her life? How much free will did they have, given their cultural restrictions? When it is time for Deborah to find a husband, her ordinarily stingy Zeidy starts spending money. How does this rampant materialism conflict with the community’s values of modesty and simplicity? How does this kind of materialism differ from and how is it similar to materialism in secular life? Discuss your reaction to the fact that Deborah’s mother fled the community. How different do you think Deborah’s life would have been if her mother had not left? Even though her marriage is arranged and she has very little say in the matter, Deborah originally views her impending nuptials as an opportunity for freedom. Was she naïve? Did her marriage with Eli constrain her even more than she already was? Deborah’s description of going to the mikvah is one of the most harrowing of the book. How did her experience at the ritual baths expose the most glaring hypocrisies of her religion? How did Deborah’s responsibilities shift when her son was born? What do you think ultimately led her to summon the courage to leave her community? Deborah writes about the abuses that are allowed to run rampant in the Satmar community—from her own father’s untreated mental illness to pedophilia. From Deborah’s account of life in the Satmar Hasidic religion, do you think the community will ever be able to change or be reformed?